Anyway, I think the trip was a good shakedown for him as he really put it through its paces on some rough and tight terrain. I give Jay some major credit for not being afraid of squeezing it through a few spots. I witnessed rear tires leaving the ground several times. Anyway, here's a some shots of it and a short clip made by another forum member following it out of camp. 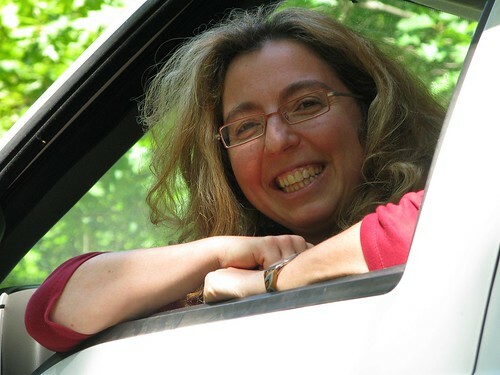 Having the Eco Roamer at our event was like having a special guest star show up. I hope it ended up being a productive test trip for you. It was nice meeting you and your family. Great build! I can't wait to see more! I read through the whole thread yesterday, very impressive build. 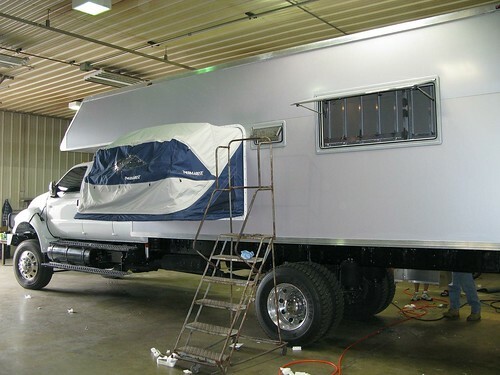 I am a foreman at a fabrication shop and we make fully enclosed race car trailers, among other things. We use a full aluminium chassis and framework and then sheet it using Di-Bond. We used to use the Alucobond but we found the Di-Bond is available in a greater variety of colours, sizes and thicknesses. Seeing your torsional testing is very interesting. Can't wait to see the rest of the build. We're up in Canada at the moment and haven't had a lot of internet access, hence the lack of posts -- sorry! However, we're connect again now using our snazzy new "Internet In Motion" system - read about it here! b) nothing leaked - through torrential rain and substantial dust, the interior stayed dry and clean. c) We're still running on the highway duallies (not the Conti MPT81's yet) but for the moment we're getting 8-10MPG which (combined with the 125Gal fuel capacity) gives us almost 1,000 mile range - taking some of the bite out of the fuel prices. So far we've only found one BioDiesel station - they don't seem to have them in Canada?!? 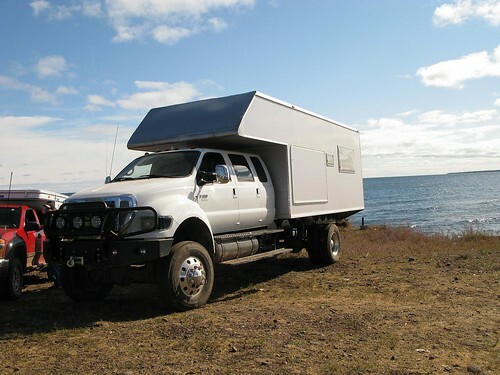 I'll be driving the vehicle back to Sturgis, Michingan this week and then comes the job of fitting the interior, the electrical system (including the solar panels), and the plumbing. A very happy Mrs. EcoRoamer - Hey, it only took 3 years to get here! Stay tuned, there's lot's more adventure to come - but in the mean time: "It works!" 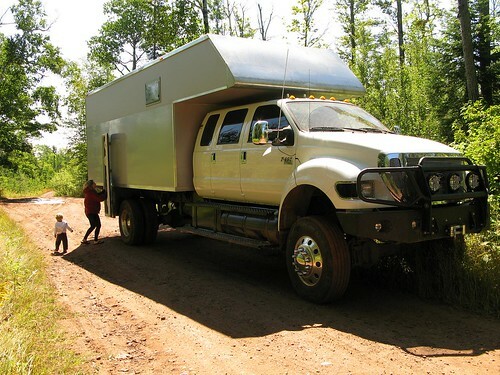 you have just given a new dimension to the definition of full size camper. Most of the people here in Europe use Sikaflex 252 or other variants with high ultra violett resistance or higher strength to build their cabins. This is also used a lot for boats. This polyurethane adhesive has a strength of 4 N/mm&#178; (569 lb/sq.inch). This bonds like hell and it is easy to work with. You need primer for some materials. The only chance to separate bonded parts without damage is to heat the glue and then cut. This seems to be similar to Degabond. c) We're still running on the highway duallies (not the Conti MPT81's yet) but for the moment we're getting 8-10MPG which (combined with the 125Gal fuel capacity) gives us almost 1,000 mile range. Maybe you should carry a jerry can or two just to be safe. Just kidding. This polyurethane adhesive has a strength of 4 N/mm² (569 lb/sq.inch). This bonds like hell and it is easy to work with. You need primer for some materials. The only chance to separate bonded parts without damage is to heat the glue and then cut. Sika products are available here, and 3M has an amazing bonding agent called 5200. It takes a couple days to set up and cure, but once it does, you will NEVER seperate the components which you joined. Never. Actually, one needs to be very careful with its use because if you glue down a component which eventually requires replacement or repair, you'll end up doing tons of damage removing it. For gluing together a camper though, I can't think of anything better. They actually make a product called debond , which will remove 5200 really well, but it does do a good job at holding things together.